This Christmas, Isaac asked for a robot car. We’d talked about giving him opportunities to begin experimenting with programming, and this seemed like a reasonable way to go. Being the cheap guy I am, I trolled Amazon for the robot car that came with the most features for the least amount of money, knowing full well that it would probably be some cheap Chinese knockoff. After looking at a wide range of offerings, I decided on a car marketed by Sunfounder knowing the instructions were probably crap, but confident in my ability to make it work without them. Christmas day, Isaac and I sat down at the kitchen counter and went to work. The kit assembled easily enough, but there were a few hiccups. The paper backing on the plastic is hard to get off. I ended up sticking each of the parts to a piece of super-sticky duct-tape and tearing the tape off in order to get the backing off. There is probably an easier way, but I didn’t bother looking for it. 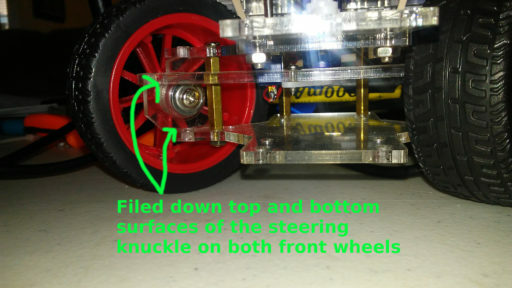 The plastic pieces that the front (steering) wheels screw into (the steering knuckle if it were a real car) is slightly too big. If you tighten the screws all the way, the steering binds up. I ended up filing down the top and bottom edges to open up some slack. There were a few missing screws. There is no power switch. 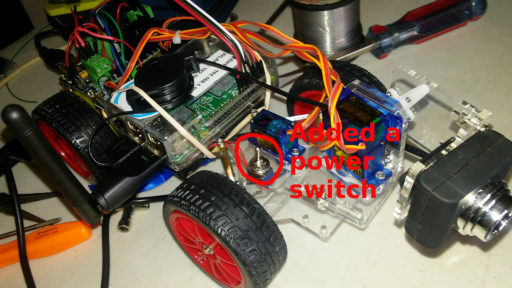 As soon as the batteries are installed, the entire car is powered up. I didn’t like that approach, so I installed a small toggle switch I had in the workshop on the positive (red) wire between the battery pack and the power regulator board. There isn’t a way to cleanly shut down the pi unless you log in remotely and shut it down that way. I’ll eventually add a pushbutton and write a code snippet to use that to trigger a soft shutdown on the pi — but that’s for later. Otherwise, the hardware went together pretty well. 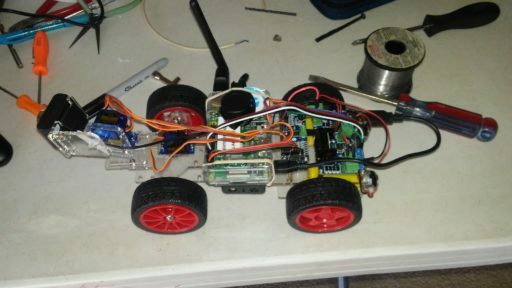 The design calls for screwing the Pi down on the chassis, but we opted to put the pi in a case, and used a rubber-band to hold it on the chassis. We didn’t want to dedicate the Pi solely to the car. If you ask my kids what I think about making plans for the future, they’re likely to say that I believe in having a plan, a backup plan, and a backup backup plan, then being ready to throw all of that away when the right thing comes along. However, when it comes down to it, the plan and its backups seem to only really exist to make me feel a little bit better about the fact that I’m basically powerless when it comes to my future. This point has once again been reinforced in my life. When we lived in Texas, we made plans. Plans that were cherished. Plans that were detailed and intended for execution. Some of those plans got put on hold when I got orders for New Mexico. Some of those plans came crashing down in flames, destroyed forever. The process of giving up on them was rather painful, and I made new plans in an attempt to fill the void. Mostly, those plans involved getting back to Texas as quickly as possible and putting myself in a position where I could teach in a non tenure-track role and write without sinking my family finances. As a part of those plans, I had made it clear to almost everyone within earshot that nothing could convince me to stay in the Air Force past my retirement eligibility date or take another assignment. There wasn’t going to be anything that would entice me to move again unless it was to a place where I would be able to stay and start my post military life. I also withdrew from a nearly complete professional development course to ensure I wasn’t going to be offered another promotion and put myself in a position where I might consider staying longer. I was going to finish my time in my current job, retire, then go back to my place in Texas and learn to live the life of a civilian. I had backup plans, and backup backup plans, but none of them included moving again with the military, promoting again, or staying longer than 20 years. That changed a little over two weeks ago. I was at work dealing with some admistrivia when an unsolicited email from someone at the Air Force Academy popped up in my inbox. Attached to the message was a letter inviting me to apply for the position of Permanent Professor and Department Head for the Department of Electrical and Computer Engineering. The letter explained that this position should be viewed as starting a new career. While the department head is still on active duty, they are not subject to many of the things I’ve grown tired of. Whoever gets the position serves in the grade of Colonel, and never deploys or moves again until they die, voluntarily retire, or reach 64. Now, this letter wasn’t uniquely targeting me, but rather it went out to everyone who was technically qualified. However, it represents a scenario I hadn’t considered as even remotely feasible before. I have always wanted to teach, but the options to do so were never viable. Part of the drive to endure to retirement was so that I could afford to take a job teaching at a junior college or other institution more concerned with education than publications, grants, and prestige. My best attempt to meet this need while on active duty meet with severe disappointment after finding out that AFIT (the Air Force graduate school) had fallen into the trap of publications and prestige at the expense of the students. I was offered the position but had to refuse it, and I gave up on trying to teach while on active duty. Unlike AFIT, the Academy understands that their reason for existence is to educate the upcoming generation of Air Force leaders. They understand that the proper role of research in that environment is to enable the development of students. They haven’t fallen prey to the siren song that has blurred the focus of almost every major university. I truly believe the Academy represents an opportunity to teach, mentor, and focus on developing young men and women. It’s too good an opportunity to pass up. For the last couple of weeks I’ve been putting together the materials for an application, and yesterday before leaving work I officially threw my hat in the ring. My odds aren’t great, but I’d forever regret it if I didn’t try. Is this the new and unexpected plan I tell my children to be ready for? Maybe. I hope so, but I still have my backup plans.